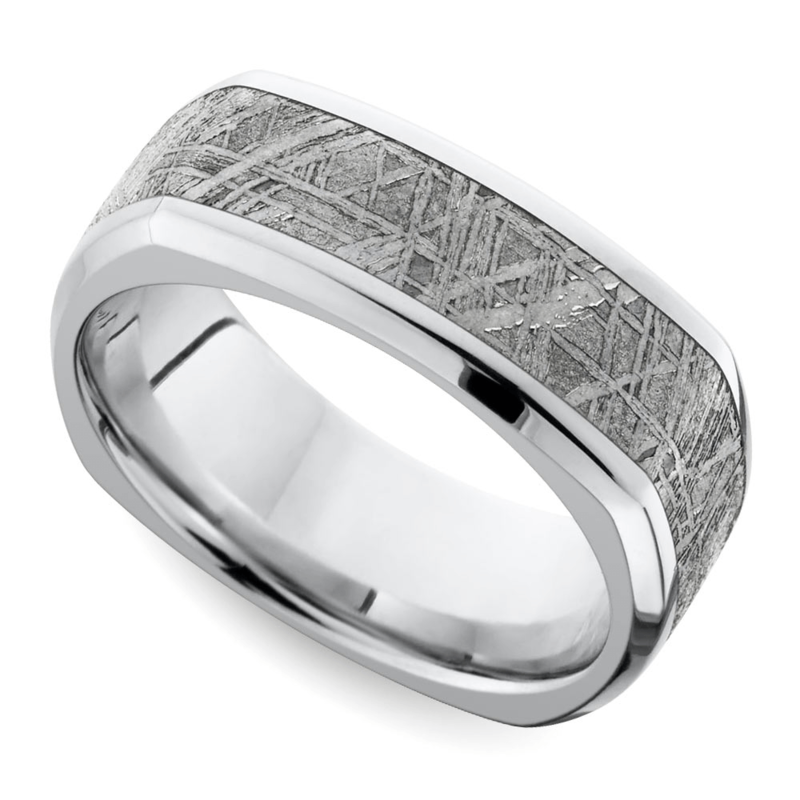 Designs for men’s wedding bands are as unique and individualized as each groom wearing them. Eschew the conservative rut of the plain gold wedding ring and explore the array of bands that are stylized to capture his interests, personality, and style. If hunting, fishing, hiking and a love of the outdoors dominates weekend activities, then present him with a ring inspired by, or depicting, the rugged wilderness. 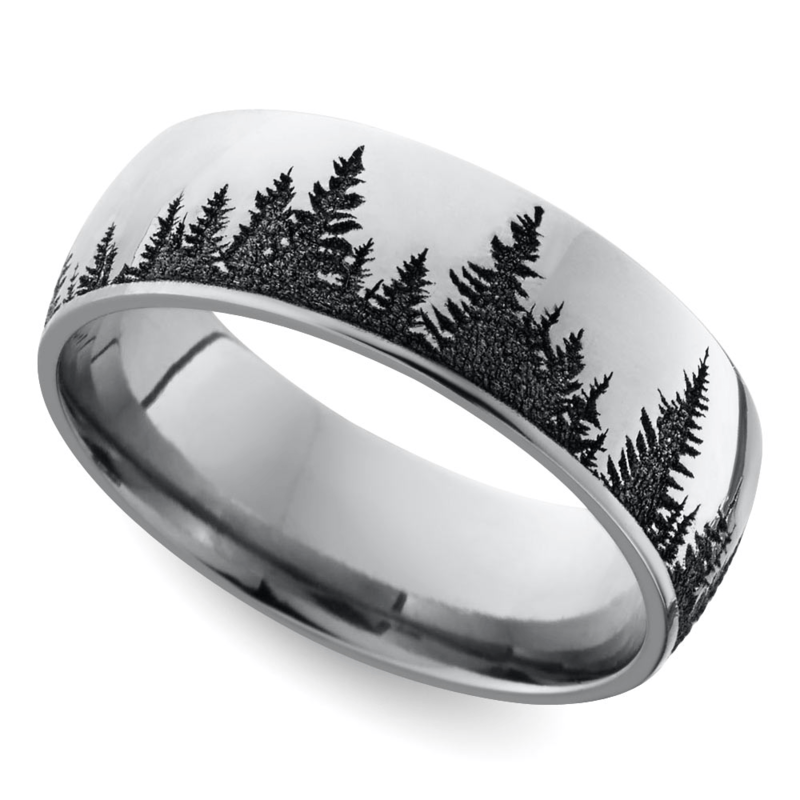 Men who want the rugged design of the outdoors incorporated into their rings can find unique rings featuring natural landscapes. 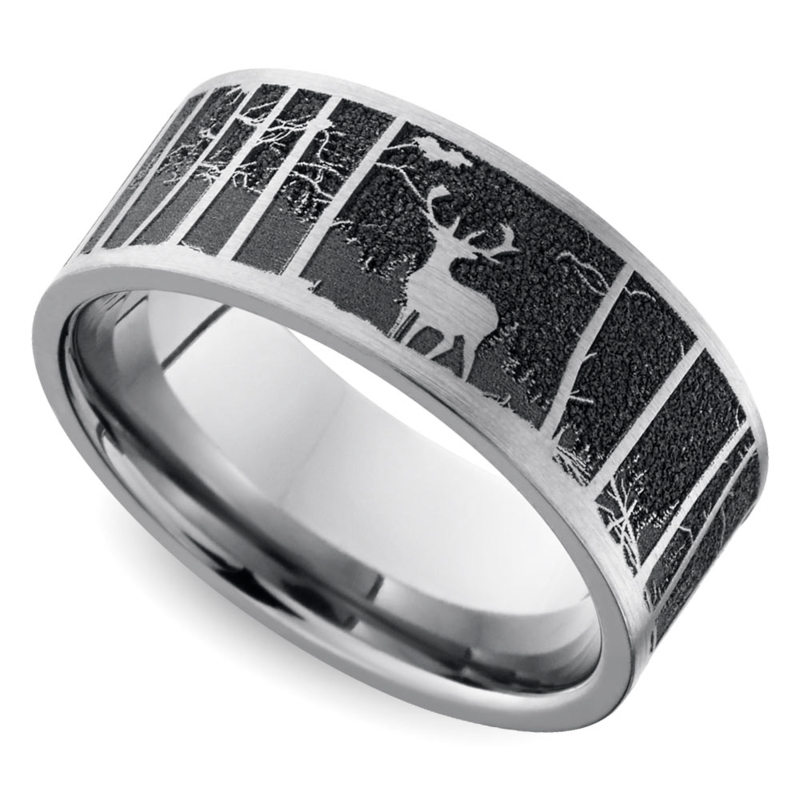 The laser-carved mountain themed ring features a buck against a mountain-lined background. Nothing speaks more to the outdoorsman in your man like a classic scene from nature such as this. The strong titanium metal will stand up better than gold or silver to his undoubtedly active lifestyle. 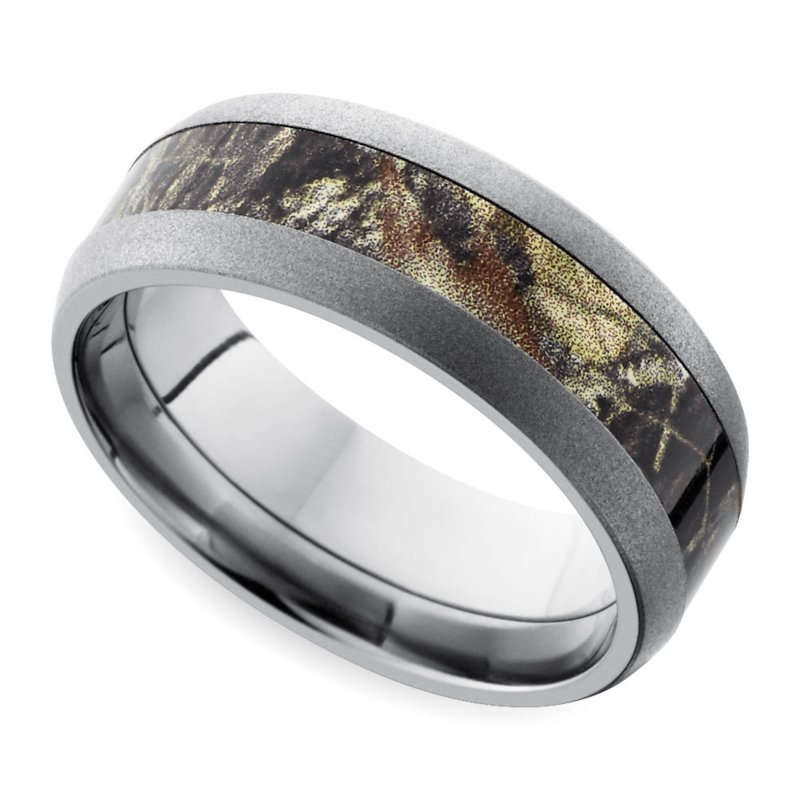 A line of pine trees surround a cobalt band to create the laser-carved pine tree pattern ring, or for the hunter at heart, a squared antiqued wedding band offers a laser-cut, scrolling antler motif, or he can look for a band featuring a camouflage pattern inlay to represent this pastime. If the television is set to ESPN, he finds peace on the links or he knows the exact date when pitchers and catchers are set to report for training, embrace his fandom with a ring that takes a nod from his favorite game. 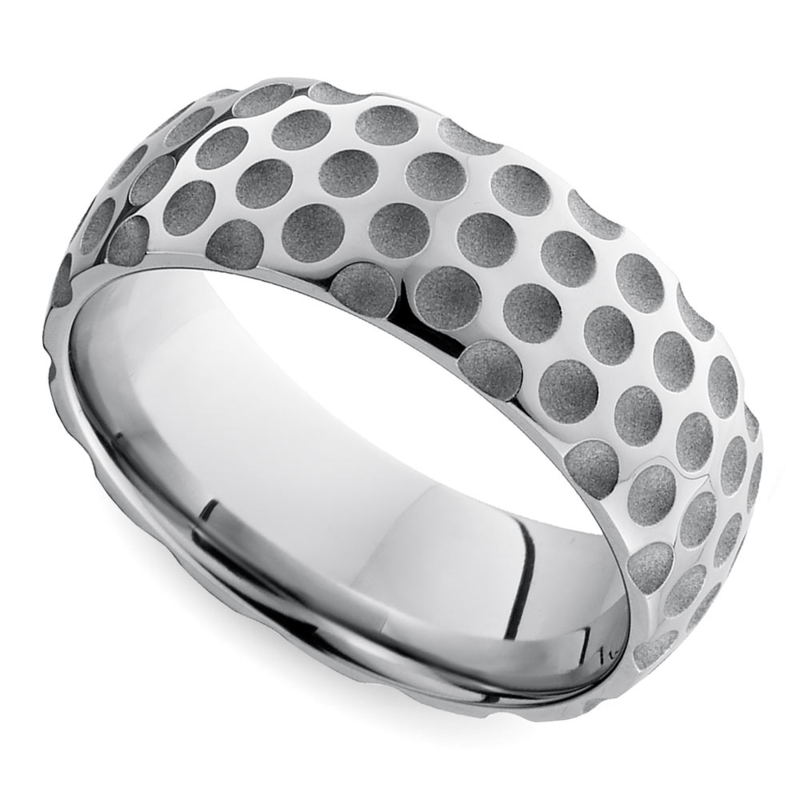 Score a hole-in-one by sealing vows with the mixed finish golf ball band. Set in cobalt, the six millimeter band is dimpled to resemble a golf ball. The game–and the vows–will never be far from his mind. Hit a marital grand slam when his baseball obsession is celebrated with the beadblasted baseball pattern ring. The cobalt band features a baseball’s signature red seam design in an infinity pattern that encircles the ring. Even if his NCAA bracketology isn’t the greatest, shoot from the line and score big with the stipple finish basketball ring. Grooved lines create the basketball details and the stipple finish provide the signature bumpy texture of the ball on this durable titanium band. Whether he cheers on the Red Devils (Manchester United! ), Inter Milan or Barcelona, shoot the winning goal by giving him a soccer ball wedding band. 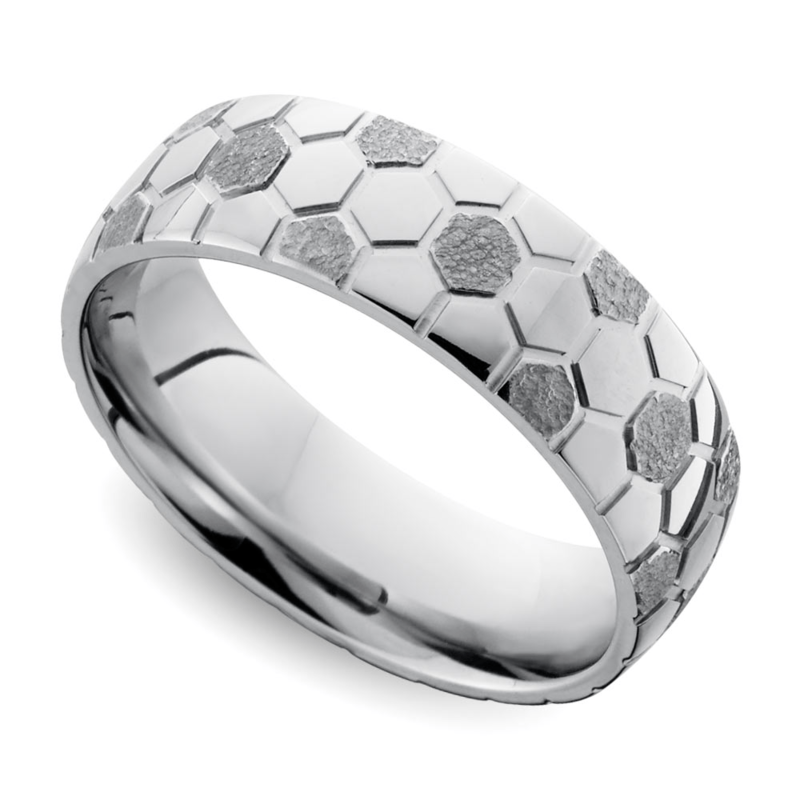 The mixed finish soccer ball patterned wedding band in cobalt displays the unique hexagon pattern of the soccer ball accentuated by a stipple finish. For the man who is destined for the cover of GQ, knows trends and adopts a unique sense of fashion, pick a wedding band that redefines style. Opal inlays provide a rich depth to an otherwise simple band. Opals can display an aloof coolness or they can exude fire. Choose the color that reflects his personality to create a ring like no other. 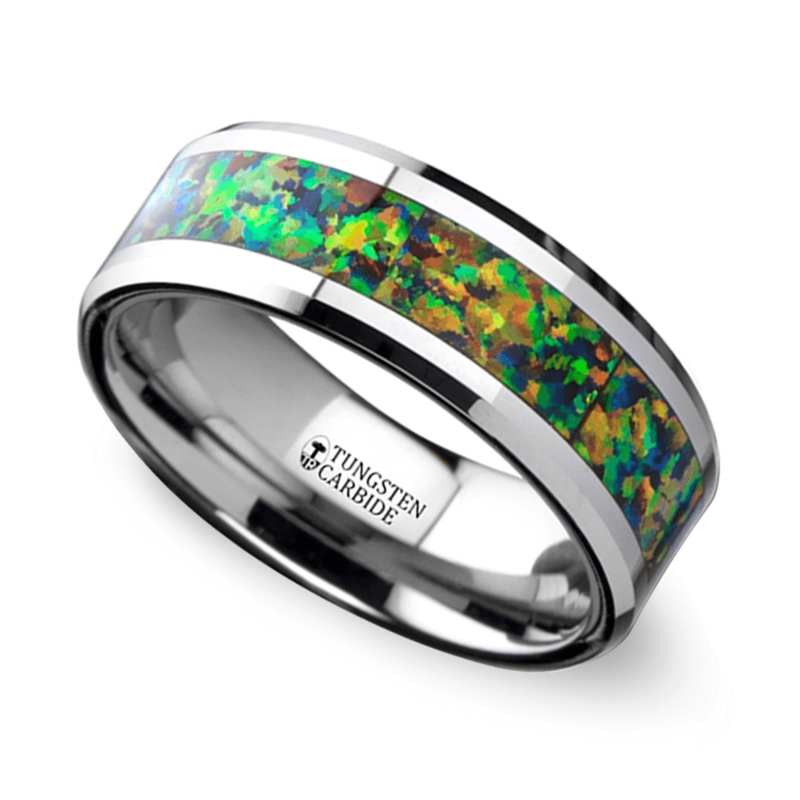 A tungsten band features a blue and orange opal inlay that gives off sparks of interest and diverse color tones. However, a tungsten band with a red opal inlay creates images of fiery lava encased in metal. To capture his laid-back personality, the cool but vibrant tones of the blue green opal inlay create a dynamic and soothing design element. The ruggedness and simplicity of nature creates the most refined and fashion-forward ring designs. Rings featuring pieces of the Gibeon Meteorite evoke a feeling of otherworldliness. Set in platinum, zirconium, titanium or cobalt, the Gibeon Metorite inlay is a genuine piece of a falling star that is approximately four-billion years old. For a sleek design component, wood inlays, like a Koa wood band, offer a rustic and rugged richness. Native to Hawaii, koa means “warrior”. This wood was used to create weapons and canoes. 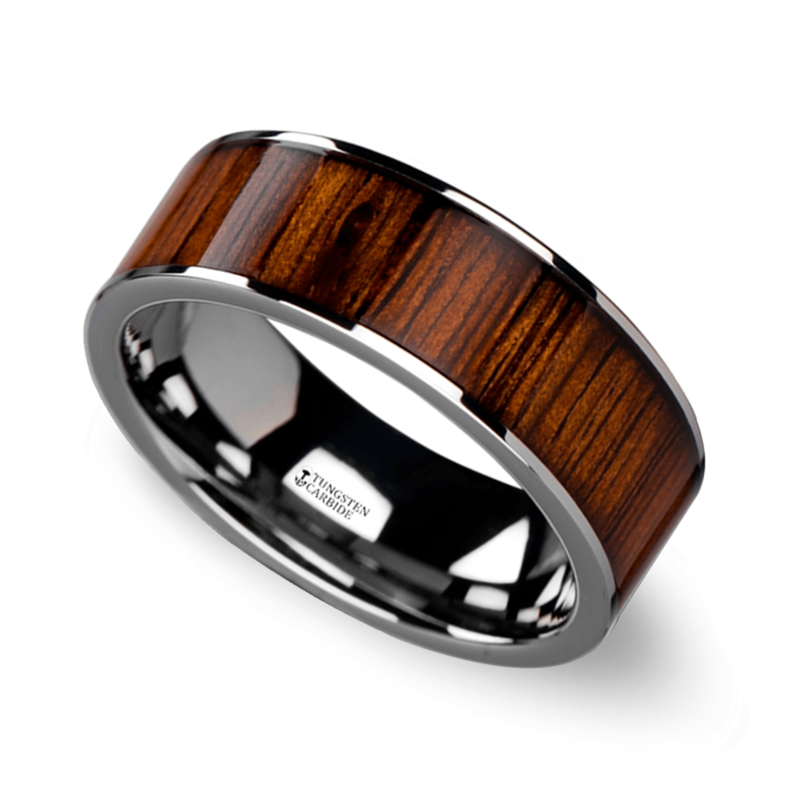 Choose a ring set in gold or tungsten with a thick inlay of koa. Add diamonds for additional appeal. Or let the elegance of the wood stand alone. Other fashion forward men might look for striking design elements. The folded metal patterns in Damascus Steel and Mokume Gane bands stand out from all other designs for their uniqueness. 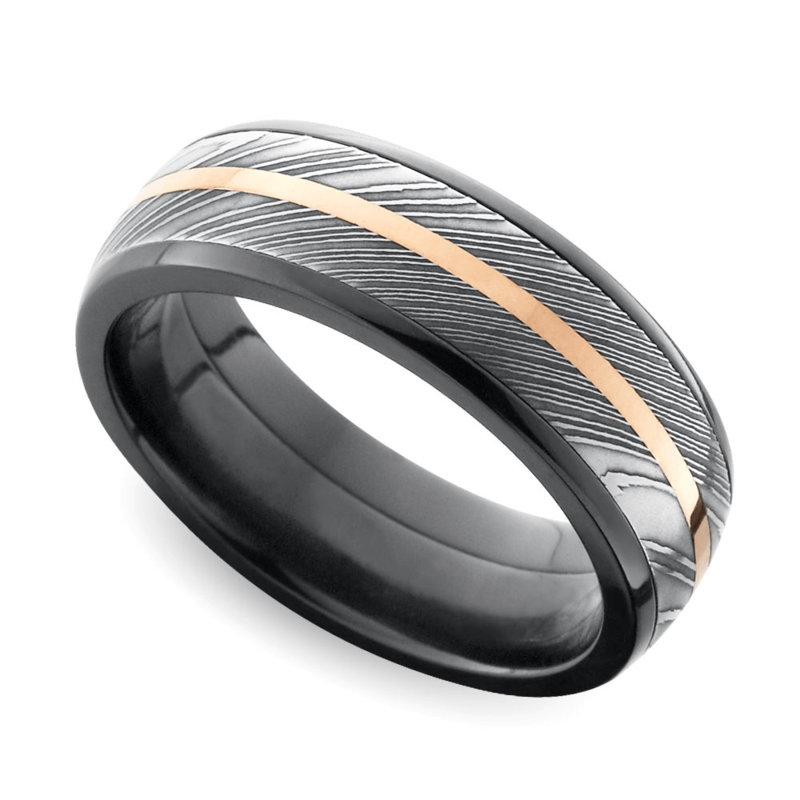 No two bands made with these metals are the same, meaning your stylish man will have the perfect band to express his individuality. Use his interests, personality and passions to find a unique ring that represents the future and the vows that seal the marriage. Forget the simple gold band, and explore bands that are as bold, confident, cool and crazy as your love for him.